"A light, refreshing, and easy to make pie. It's one of my summer favorites." Combine 3/4 cup sugar, cornstarch, water, lemon peel and juice, and egg yolks in a saucepan. Beat well. Stir while cooking over medium heat until thick; it will thicken just as it starts to simmer. Remove saucepan from heat. Add cream cheese to lemon mixture, and stir until incorporated. In a small bowl, beat egg whites until stiff; add remaining 1/4 cup sugar. Fold sweetened egg whites into lemon mixture. Spoon filling into shell and chill. This is dessert is great tasting and "easy as pie". Wow! This was really easy to make and tasted wonderful. I'll be making this one again and again. I made this for Easter tomorrow...it is great! 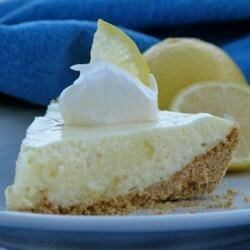 My husband's favorite pie is lemon meringue and I hate it...this is a perfect compromise for us. Thanks for sharing!